PM vows to defend 'the right to settle in the Land of Israel' in new Basic Law to make Israel a Jewish nation-state. 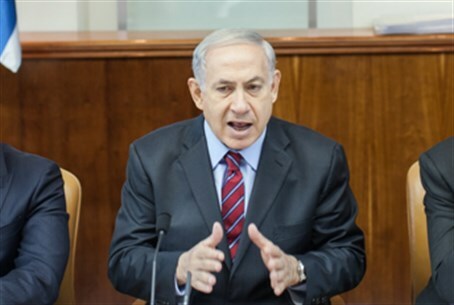 Prime Minister Binyamin Netanyahu (Likud) addressed the fundamental proposal to declare Israel a Jewish state on Sunday, at the start of his weekly Cabinet meeting. Netanyahu began by defining, in his view, the basic nature of the State of Israel. "The State of Israel is Jewish and democratic," he began. "Our Basic Laws give us full expression of the democratic side of our country; we do this by giving full and equal rights to every Israeli citizen." On the democratic side, Netanyahu said, Israel actualizes its dedication to freedom through two Basic Laws - "the Basic Law of Human Dignity and Liberty and the Basic Law of Freedom of Occupation." The Jewish side, however, needs to be strengthened in Israel's legal framework, according to the Prime Minister. "Despite this, the existence of the State of Israel as a Jewish state does not actualize itself enough in our Basic Laws, which is what the proposed law aims to fix," Netanyahu stated. He stressed that the law would define Israel's character - but not, as critics accuse, restrict the rights and freedoms of non-Jewish citizens of the State of Israel. "The [proposed law] would change the definition of Israel as the Jewish State of Israel, and would not harm the status of every individual citizen in the State of Israel itself," Netanyahu said. "It would defend the right of settlement in the Land of Israel as a Basic Law, it would anchor within our Basic Laws fundamental national symbols - our national flag, our language, our national anthem, and other elements of our national identity." "These elements are under constant attack, which ebbs and flows, from abroad and even at home [in Israel]," he continued. "But, the fundamental existence of the State of Israel flows from its existence as the national home for the Jewish people and the deep bond between the Jewish people and the Land of Israel." Netanyahu also dismissed cries by Opposition and leftist MKs to shelve the proposed Law, noting that arguments for a two-state solution without the declaration defies logic. "They want a Palestinian national state to be built beside us, and to turn the State of Israel, meanwhile, into a bi-national state, Jewish-Arab, within our restricted borders," the Prime Minister noted. "But I am saying something simple: it is impossible to hold the staff of our nation together by gripping these two extremes. It is impossible to say that we want to separate ourselves from the Palestinians in order to prevent a bi-national state - something with a certain amount of logic to it - and then also say that we want a bit-national state, Jewish-Arab, in the current borders of the State of Israel." "The State of Israel gives equal rights - equal rights for the individual and for every citizen - but she is a state for one nation: the Jewish nation - and no other nation," he concluded, adding that "the new law will be formulated with input from every element of the coalition, in order to preserve both the Jewish and democratic nature of the State of Israel." Netanyahu announced the move last week, when he also attacked leftist groups for calling for Israel as a Jewish State on the one hand while asking Israel to make major territorial concessions on the other. On Sunday, the Prime Minister added that the move is not a political one, as the Opposition proposed a similar law during the previous Knesset term - and he had pledged to support it.